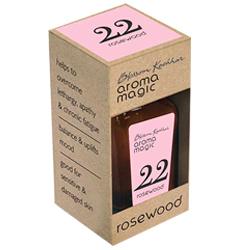 Buy Aromamagic Rosewood Oil for Acne, colds, dry skin, dull skin, fever, flu, frigidity, headache, oily skin, scars, sensitive skin, stress, stretch marks. Relieves Body Pain including Arthiritis. Helps to treat in digestion and sore throat. Helps to overcome lethargy apathy and chronic fatigue, Balances and uplifts mood. Good for sensitive and damaged skin. Acne, colds, dry skin, dull skin, fever, flu, frigidity, headache, oily skin, scars, sensitive skin, stress, stretch marks. Sweet, woody, fruity, floral aroma. Anti-ageing and tonic. For depression, fatigue and respiratory infections.